Q. What is the Texas Boating Safety Education Certificate? A. The Texas Boating Safety Certficate (also known as the Texas boating license or boater's license) is proof that you have met the mandatory boat safety education requirements for the State of Texas. The Texas Boating Safety Certificate is good for life and does not need to be renewed. A.The boating safety certificate is proof that you have successfully completed a boating safety course. The safety certificate does not expire and does not need to be renewed. 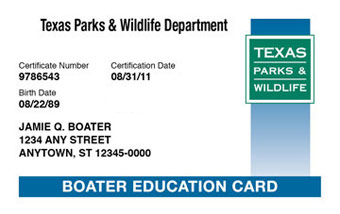 Therefore, it is NOT a Texas Boating License although that's what most people call it since they are used to the term. Q. I do not have a driver's license. Can I still get the Texas Boating Safety Certificate? Q. How can I get my Texas Boating Safety Certificate? Pay the one-time fee of $19.95. Study the Texas Boating Safety Certificate course and take the final exam. Print off your Temporary card immediately, and your permanent card will be available for download from the Texas Parks and Wildlife Department site. Q. Who needs a Texas boater license? A. A boating safety certificate is required for all boaters who were born after September 1st, 1993 when operating any motorized vessel, any wind-blown vessel over 14 feet in length, or any personal watercraft (PWC) on State waters in Texas. For more information please consult the Texas boating laws and regulations page. A. There is a one-time fee of $19.95 paid to BOATERexam.com®. It includes unlimited attempts at the final exam. Learn more about BOATERexam.com's Risk-Free Policy.